If you're shipping paintings, sculpture or other artwork, picking a shipper who has experience in Art Handling, such as Goodman Packing and Shipping, is important. Art Handling means more than wearing gloves when packing artwork or moving it. At Goodman Packing and Shipping, we have Art handlers with industry training and experience to ensure that every piece of art we ship gets handled correctly. 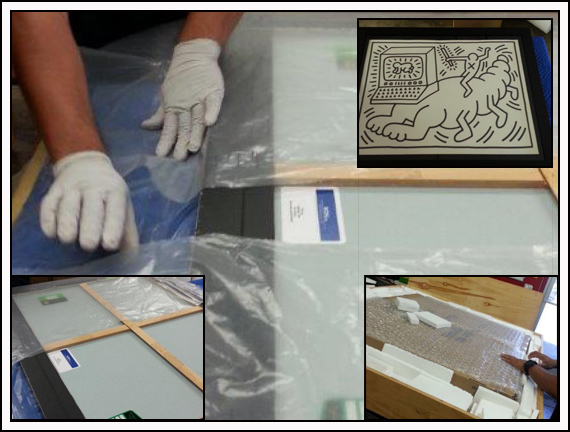 Our White Glove pickup and delivery service ensures that your art work is handled properly every step of the way. Your artwork is properly packed to ensure that temperature/humidity conditions do not adversely affect your shipment and items are securely packed and crated(or palleted). Give us a call online (it's toll-free) or email us, we'll be glad to answer any questions and provide you with a solution that fits your art shipping needs.